If you've ever wanted to put your magic to the test against your friends (or strangers), go out right now and download Wands, the inaugural VR game from Stockholm's breakout NUX Studios. 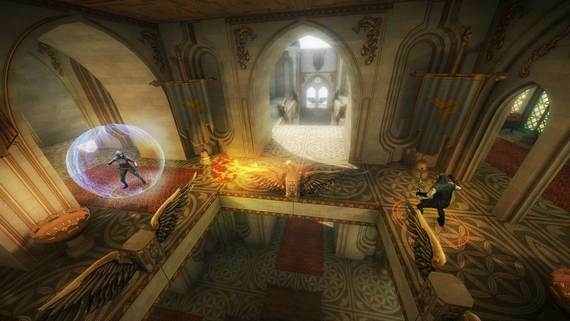 Available now for the Samsung Gear VR, Wands is a mobile, Internet-connected PvP (player-vs-player) dueling game that transports you to a magical otherworld called "The Beyond" to do your dueling (via a portal based in a steampunk 1880s London). When you begin, you select four spells that make up your wand -- each comes with its own pros and cons. How you assemble these spells is crucial to your performance as a "Wielder." Some may not inflict extreme damage, but they also don't cost you much "Mana," the spiritual energy that allows you to cast spells and teleport -- another crucial feature of the game. Teleporting allows you to move around the space, whether you're evading or hunting down your opponent. If you drain your Mana too quickly, you're a sitting duck. You can't move, you can't defend yourself, and you can't fight back. So striking the balance between the quick-and-light spells and heavy hitters -- such as my personal favorite, "Stone Demon" (an enchanted turret that fires on your behalf) -- is a vital part of strategy. 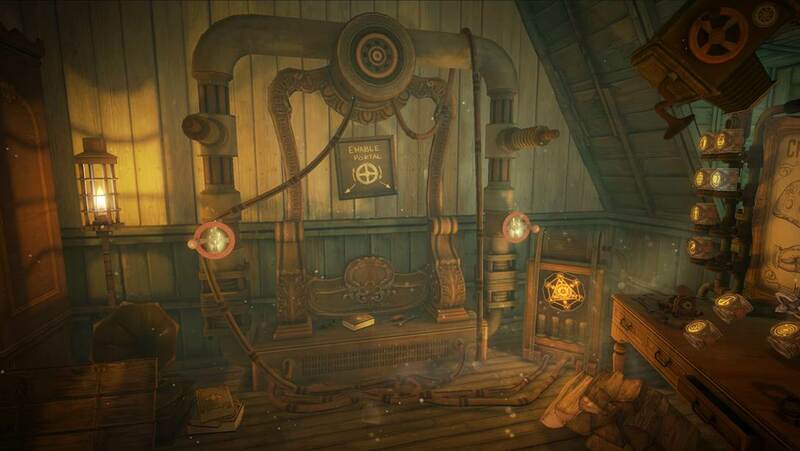 The team at NUX Studios has been designing this game for years, and since spells are the principle interactive element, they've dedicated serious attention to revising them to perfection. "The spells are a very central part of the game and we have been testing many different spells throughout the two years the game has been in development," said Wands Producer Ricky Helgesson. "Most of the spells did not make it into the final game. We found that the spells should be diversified enough to make it into the game. We have looked at games like Magic: The Gathering and Hearthstone and movies like Harry Potter and Lord of the Rings and then tried to implement them in virtual reality. It has been a blast and we have a long list of interesting spells that will be added in the future." Of course, your strategy will change depending on who you're playing. When dueling close friends, you can make choices based on your knowledge of their proclivities that might not be as effective with total strangers. And it gets even more complicated when you factor in the different dueling arenas that make up The Beyond: Aspis Prison, Temple of Ophidian, and The Celestial Halls. Each toys with visibility and space in different ways, so strategies become even more complex depending on where the duel takes place. The video below offers peeks of all three. Maybe the most groundbreaking part of the game is its social component, embodied foremost in the split-screen spectator mode. As we've discovered with the rise of Twitch, sometimes watching the game can be as rousing as playing it yourself -- and of course there are times when watching is even preferable. With the split-screen spectator mode in Wands, players can share the experience, allowing those outside the headset to watch the duel unfold on a flat screen, resurrecting the energy of gathering around a console to play a game. I'm a huge proponent of VR content and tools that find ways to bring us together in the face of the medium's potential for isolation, and with the built-in spectator mode, Wands does exactly that. There's a delicious dramatic irony in viewing a duel in spectator mode; you know the "full story" as it unfolds while the players are suspended in their own immersed worlds. Whether it's played at a VR meetup, game night, or party, this feature makes a social event of the gaming experience. This game may draw comparisons to Unspoken, Oculus Touch's recent dueling offering, and while they do share some basic concepts, the execution and ideas underpinning them are quite different. Wands has been released for Gear VR, which makes it much more widely accessible, and more importantly, it lets users ditch the cables and computer. Wands is not a game you play sitting down. Your opponent could be anywhere around you in a duel, so you have to keep looking in many different directions -- often around corners of hallways or tunnels -- and to do so, you need to spin around. As others have pointed out, the gameplay is so fluid that you'll find yourself trying to duck when your opponent launches an attack, but that's not how the game works; if you can't teleport out of the way, you're in the line of fire. For being an entirely mobile game run on smartphones, Wands is unbelievably nuanced. Two years of rigorous product testing has paid off; Wands is without question the best-looking game for the Gear. The gameplay is minimalist and detailed; everything about the user experience bears the aura of refinement. Aesthetic elements like color, shadow, music, and diagetic sound (i.e. your character's breathing and grunts) work in harmony to imbue an unshakable sense of precision. While Wands is a great way to spend a weekend afternoon, it's also intended to be something that you do over time. The social element doesn't end with spectator mode; NUX has plans to create a global leaderboard to build an even deeper community. As you train and gain experience in duels, you drive your progress and scores, unlocking new spells (and they plan to release more over time). So if you train hard enough, one day you might be able to say you're the best Magic Wielder in the world. "We think that competitive games for mobile VR will be a very interesting genre going forward and we are happy to be the first truly competitive PvP game for mobile VR," said Helgesson. "From the first second of work with our networking code, we decided that a split-screen/free-flying-cam spectator mode would make the experience so much more interesting so that friends can watch you play and that people can follow top players online to learn from their strategies. This is something completely new in the domain of mobile VR and also rare in stationary VR games." For such a new company, this game is an amazing feat. So, who exactly is behind NUX Studios? "NUX Studios was formed during the winter of 2016 by the content team of Univrses, a tech company working with inside-out positional tracking for mobile VR and AR," said Helgesson (who is also Founder and CEO of Univrses). "The team was expanded with more people and now has experiences from the movie industry (Swedish Academy Awards winner for Best Visual Effects), the gaming industry (Frostbite and Battlefield series Tech Lead and Producer) and other top virtual reality developers. NUX Studios works with projects within AR, VR and MR in games, entertainment and applications, where Wands is the first product that is launched." And man, if Wands is only the beginning, I cannot wait to see what's next from NUX Studios. In the meantime, strap into your Gear, download Wands for yourself here, and get dueling.